When talking about Full English breakfasts, there’s only one nutrient I’m interested in: carbs! Fuel in Withington is a wonderful meat-free cafe/bar with quirky and fun decor (including the prettiest painted tabletop you’ll ever see) and a lovely, lively atmosphere. Despite the fact that it’s open all day, I’ve only ever been in for breakfast. And I’ve been a few times for that. It’s good. 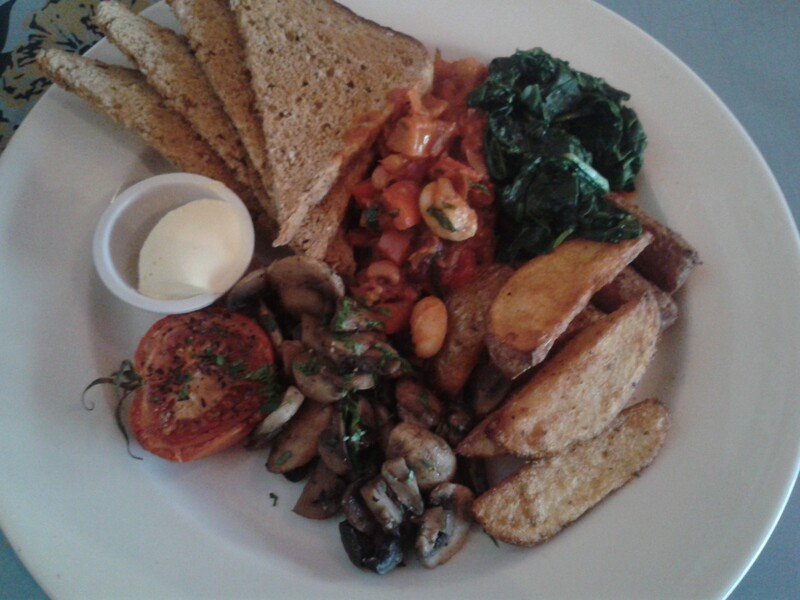 The full vegan breakfast is £5.70 and consists of a grilled tomato, some fried mushrooms, sweet potato wedges, spicy beans, two sausages, wilted spinach and some toast. Homemade beans are a really nice touch on a cooked breakfast plate, though these ones are perhaps a smidgen too spicy for me, especially alongside the fiery wedges too. The vegetarian breakfast includes hash browns, but I think it’s nice to have a twist on that with the wedges. I’m always rather “meh” towards a grilled tomato, but the mushrooms were good, and the spinach was really nicely cooked. Crucially, the beans were not very juicy, so there was no contamination to worry about. The toast was nice, but the bread wasn’t remarkable. Still, it was a good generous portion. 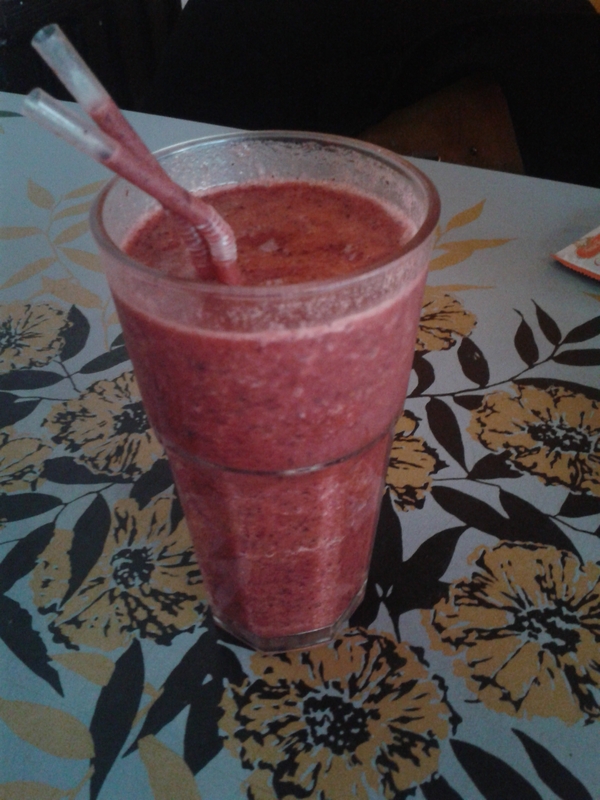 Alongside the usual hot drinks, Fuel also offers vegan smoothies. I gambled on the mixed berry and passionfruit and it was so good and refreshing – it certainly cooled me down after the spicy elements of the breakfast! This entry was posted in Travel, Vegan Mofo and tagged Fuel Manchester, vegan breakfast, vegan Manchester, vegan mofo. Bookmark the permalink. Pleased to see Fuel on the list, they are always reliable in my experience and I love that they also do a breakfast burrito. I meant to try the burrito before I moved away, but I never got round to it! That made me laugh! Carbs for lyfe! Who would be crazy enough to cut them out of their diet? !